Inducted into the James Beard Foundation’s Who’s Who of Food and Beverage in America, DORIE GREENSPAN is the author of Dorie's Cookies, a 2017 James Beard Award-winner for Best Baking and Dessert book; Around My French Table, a New York Times bestseller that wasnamed Cookbook of the Year by the IACP; Baking Chez Moi, also a Times bestseller; and Baking: From My Home to Yours, a James Beard Award winner. She lives in New York City, Westbrook, Connecticut, and Paris. "Greenspan (Around My French Table), five-time James Beard Award winner, shares her favorite day-to-day recipes in this standout cookbook. . . Easy, delicious weeknight meals. . . Exceptional desserts. . . Whether readers are just discovering Greenspan or are part of her fan base, they will be thrilled with this." Like cookbooks labeled “simple,” the descriptor “everyday” means something different to every cook. For Greenspan, it involves a lot of really good fresh produce, herbs and citrus, and an element of surprise. Roasted squash hummus gets acidity and fruitiness from pomegranate molasses; turkey meatball soup gets a hit of heat from freshly grated ginger; and pear upside down cake is spiked with Chinese five spice instead of the usual cinnamon and nutmeg. Other standouts include oven charred peppers stuffed with cherry tomatoes, a lettuce soup with scallops, and a show-stopping triple layer parsnip cake with cranberries. 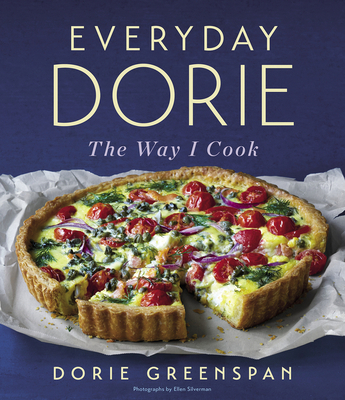 One thing you’ll find in Everyday Dorie that isn’t always in other cookbooks: explanations of what to look for: the sights, sounds, and smells of a dish in process, and clues for when it’s done. It’s a wonderful way to learn to cook anything, from a fried egg to a 10-layer torte, and a hallmark of Greenspan’s style. If you’ve ever wanted to stop by Dorie Greenspan’s house for dinner, this book is a nice consolation prize. This is “elbows-on-the-table” food, Greenspan says in the introduction. Dishes like oven-charred tomato-stuffed peppers, a caramelized onion galette with parm cream, fresh-off-the-cob corn chowder, and braised lamb shanks with tomatoes and olives. “These days I have only one rule,” Greenspan explains. “There must be dessert! Please follow it.” With recipes for boozy jumbled fruit croustade and triple-layer parsnip and cranberry cake, that won’t be hard. More meandering than her previous titles, Greenspan’s latest collects the casual foods she makes for family and friends. American and French dishes abound (Greenspan splits her time among New York, Connecticut, and Paris), complemented by international additions not found in Around my French Table. Stunners include candied cocktail almonds, spring avocado and berry salad, Luang Prabang chicken-chili sandwich, and drop-biscuit peach cobbler. The recipes are generally simple and foolproof; the kind most cooks feel confident making for guests without any advance practice. VERDICT: Greenspan’s huge popularity and cult following will assure high demand. Though this title is potentially of less interest to Greenspan’s baker fans, it will excite devotees of Ina Garten, Deb Perelman, and David Lebovitz.